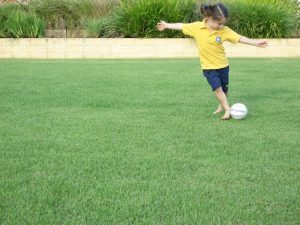 Australian lawn customers are extremely lucky to have some of the best native varieties available to them on the market. Native varieties are know as Zoyisa grasses and two terrific options available for Australia’s hot, dry climate are Native NaraTM and EmpireTM. These two Zoysia grasses are known to be the most drought-tolerant lawns on the market and thrive under stressful growing conditions. Most importantly they are low maintenance and maintain a vibrant green colour during winter. 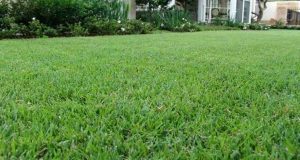 The fine leaf of the Zoysia also gives it a soft feel which is a beneficial trait for families with both children and pets. Zoysia varieties are able to tolerate more than your average wear and tear. The varieties (NaraTM and EmpireTM) have fast growth across the ground and their runners are fast and highly branching to provide excellent recovery from wear and tear. This also holds them in good stead to cope with tough drought conditions. The varieties can cope with all growing temperatures from as high as Darwin down to Tasmania. They are also known to survive in places where temperatures drop to below 20 degrees. Zoysias also perform well in both sandy and clay-type soils. The Zoysias are able to maintain a good vibrant green colour in cooler months. This makes it a popular choice for those who want green lawn year-round. Another key trait of the Zoysia grasses is the low maintenance. Less mowing is required as the upwards leaf growth is less than most other commercially grown lawns. The fast growth across the ground is what makes it extremely wear tolerant. As the Zoysia grass creates a dense sward it means there are less thatching problems. Thatch is a tightly intermingled layer of organic material (dead stems and leaves) which accumulates between the layer of actively growing grass and soil. Once the Zoysia grass is well-established it dominants the landscape and can out-compete most weeds. It is the dense growth that makes it harder for the weeds to break through and take hold. Another beneficial trait of the Zoysia grasses is the fact they are very resistant to lawn disease and pests. It is especially resistant to annoying lawn grubs which can cause painful problems in other lawn varieties. However, if symptoms do appear be sure to review and talk to your local garden expert. A major beneficial characteristic of Zoysia is that it only needs to be watered when it shows signs of needing a drink. This is when it starts to look slightly discoloured and the leaves are wilting. The deep-rooted system of the Zoysia are what give it this characteristic and help it be more drought-tolerant.